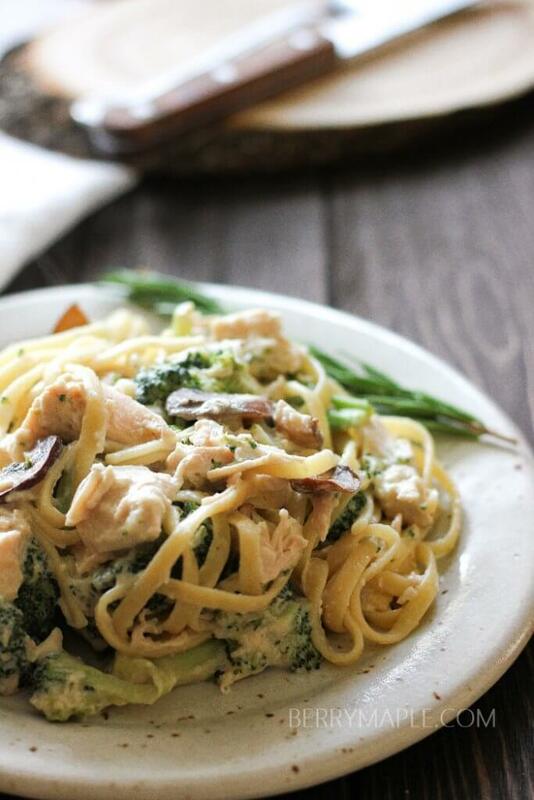 Your favorite Alfredo pasta recipe with broccoli and delicious chicken breast- the best idea for your leftover rotisserie chicken ! Easy leftover rotisserie chicken recipe. Here. Every time I go to Costco- i buy a rotisserie chicken. EVERY SINGLE TIME. Sometime it’s just a short trip for organic full fat milk they have, 2 gallon in a box. Or a trip for toothpaste and toothbrushes, oops, here you can spot a rotisserie chicken in my cart as well. It’s funny how easy it is ! Costco trips are a weekly routine in our house. Great prices, helpful workers and a great selection of meat and seafood (at least at out local Costco they always have lobster tails, crabs, all kind of shrimp; lamb, organic chickens and a huge beef section). Kids love our trips too- they always leave the store with presents and all kind of healthy snacks! So years of shopping for chickens inspired me to create all kind of easy leftover recipes with chicken breasts. I like to freeze Rotisserie chicken leftovers for later use. I dice the meat and pack in to a zip lock bag (a couple zip lock bag can be used if you cook for one person at a time). When you picked a recipe and ready to use your leftovers, just leave the plastic bag in the fridge overnight. Alternatively you can put frozen chicken in to a bowl with warm water for quicker thawing, or even leave it in the microwave for a cople minute on DEFROST setting. What to do with leftover chicken breast? Casseroles, salads, pizzas! But today we will try to make my favorite alfredo pasta. With Rotisserie chicken . Add sliced mushrooms and broccoli florets and cook for additional 2 minutes. Meanwhile slice cooked chicken breast in to small pieces. Add to your skillet and cook on medium for 5 minutes. stirring occasionally. Add cream and bring to boil, turn it down to medium and cook for another 3 minutes. Turn the heat down and add cheese. Add cooked pasta, mix it and plate, garnishing with chopped green onions and extra parmigiano cheese. Enjoy! I’m curious why the recipe says to cook the already cooked chicken in the skillet for 5 minutes. It seems that would dry out perfectly good, moist chicken. I would add it to the cream mixture as it simmers. This is such a great easy weeknight dinner the whole family enjoys! It really doesn’t get any easier than using up leftover rotisserie chicken. Rotisserie chicken has saved my life SO many times and I LOVE the idea of adding it to pasta!! This dish looks just perfect!! I’m all for using rotisserie chicken and this looks perfectly creamy and delicious! I know my kids would love this, I’m looking forward to making it soon! Using rotisserie chicken is such a handy shortcut…you can get dinner on the table much quicker! This looks awesome and creamy….yum! Rotisserie chicken is a lifesaver! I love making chicken broths with them after as well, get as much out of the chicken as you can. This pasta looks delicious, can’t wait to try. Costco has some of the best rotisserie chicken ! Perfect for salads and pasta … your recipe looks amazing, I must try ! This pasta looks so wonderful! Alfredo pasta is my favorite! This is just my kind of pasta dish!!! It looks so creamy and indulgent. Think I’ll make this for our next date night in! This looks wonderful! I can’t wait to try your recipe! We love pasta dishes for dinner on busy nights. I love recipes that use rotisserie chicken! It’s a great hack to get dinner on the table quickly. I’ve never had the rotisserie chicken from Costco before, but you’ve inspired me to try one next time I’m there for my giant packs of toilet paper and paper towels. 😉 Can’t wait to try out this delicious looking recipe! 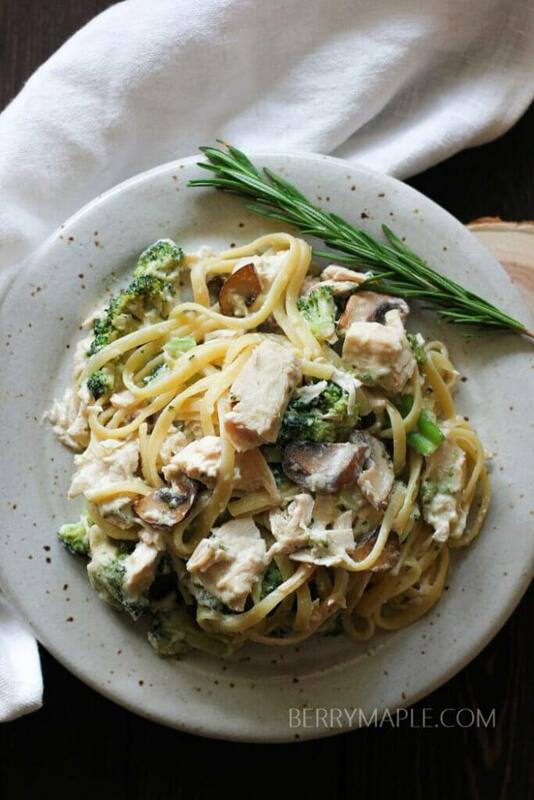 This Alfredo looks amazing! And so simple to throw together. 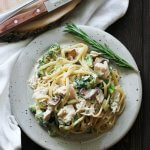 I’m loving the addition of broccoli & think I’ll try that next time I make Alfredo. I am a big Costco fan, and it always happens that you go buy 2 things, but end up buying 20. Your pasta looks amazingly delicious and these clicks are ? This is the perfect recipe to use leftover chicken with! 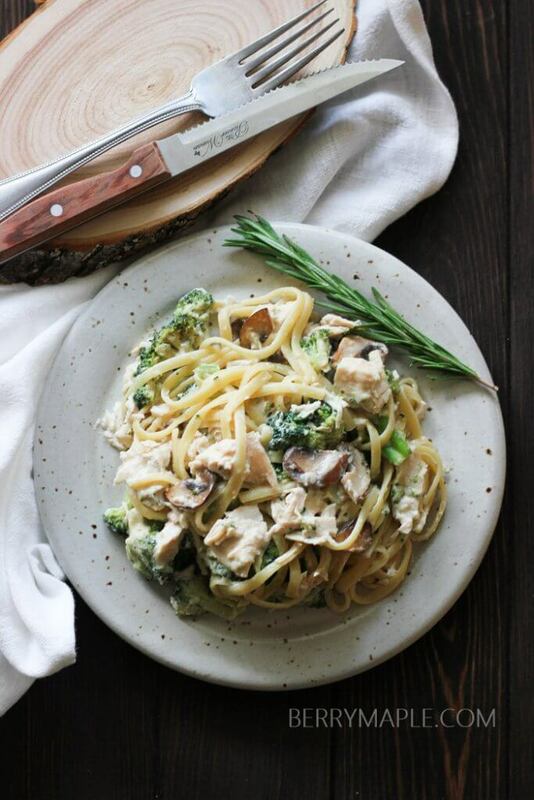 I actually have some in the fridge right now – we are so having this alfredo for dinner tomorrow!